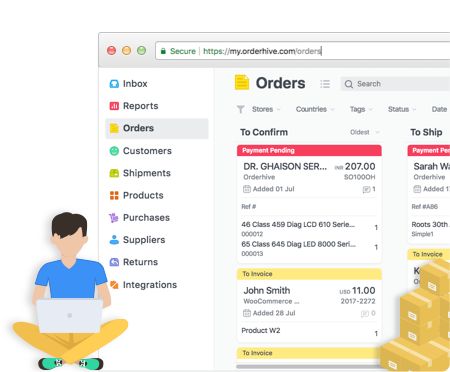 Orderhive integrates with Amazon MCF and FBA to manage orders across your Amazon and FBA warehouse. If you are looking for an efficient and cost-effective amazon inventory management software, Orderhive is the right choice for your business. Employ automated order sync across channels and amazon websites with the help of unique SKUs. Optimize your entire inventory management process for Amazon with Orderhive. Why use Orderhive as your Amazon inventory management software? Orderhive automatically syncs your inventory number across all the channels you are selling on. We integrate with the leading marketplaces and storefronts to sync your inventory and order data in real time. If you are looking for an efficient multichannel tool for amazon inventory management and other marketplaces, Orderhive is the way to go. Orderhive allows you to assign unique SKUs to your products for you to track them efficiently. We also provide hassle free management for bundle and kits - an important feature that many sellers would want in their amazon inventory management software to have. Once customers buy your products on Amazon, your orders appear on the Orderhive backend. You can manage all your sales order from a single point. You can also see the performance of your products in real time. If you are one of those many sellers, selling on multiple amazon websites, orderhive will bring you a smile. With Orderhive, you can manage sales order for all the Amazon websites at a single place.